With a higher loyalty contribution, one would expect Profit Contribution (COPE)% to be higher, due to the current correlation between Loyalty Contribution representing an increase in direct bookings and thus lower acquisition costs. Booking Lead Time and COPE % are related but perhaps more indirectly, as a shorter booking lead time can force a hotel to begin to use more costly sources of business as inventory becomes distressed, and can act as a leading-edge symptom of declining cycle strength. A longer Booking Lead Time should result in higher Guest Paid ADR. With an emphasis on driving Loyalty Contribution, the direct and repeat bookings would generate a higher Profit Contribution (COPE) % and thereby more NET revenue flowing through to the bottom line. Historically, the industry has evaluated performance based on top-line revenue and on occupancy statistics. However, it is evident that the five critical hotel KPIs for the digital age are highly intertwined and essential in anticipating movement that can affect your hotel, markets and establish the trends that drive the overall health of the industry. Group had the longest lead time of 50 days and Property Direct had the lowest lead time of 11.6 days, resulting the lead time of 18.78 days as a combined average of all channels. Booking Lead Time YOY% only grew for properties at the $220 and up. 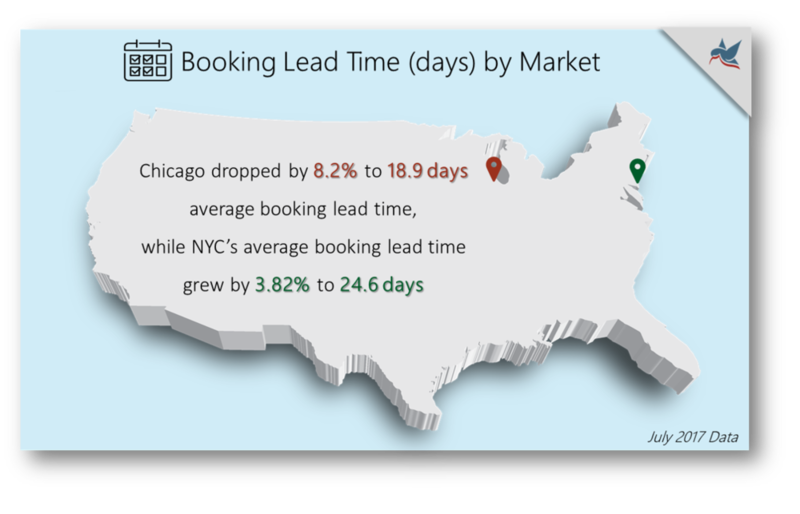 Chicago dropped by 8.2% to 18.9 days average Booking Lead Time, while NYC’s average Booking Lead Time grew by 3.82% to 24.6 days. For the complete report and to purchase an annual subscription to receive monthly updates on the U.S. Hotel Industry or the Metro Areas (MSAs) that are important to you, please visit the link below. In our next segment we will review Length of Stay, its trends and importance in tracking across the industry.